Today I'm going to show you how I gave some inexpensive dollar store candle holders, an old glass vase from delivery flowers and even an old pasta sauce jar an embellished, faux mercury glass makeover. 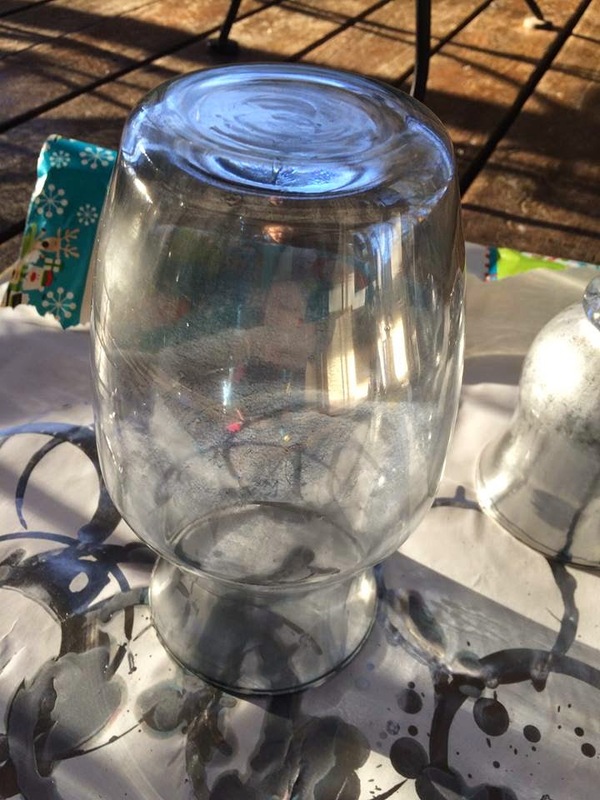 Note: for tips on cleaning and getting rid of food odors from jars, see my post on how I transformed a pickle jar into a coffee storage container. 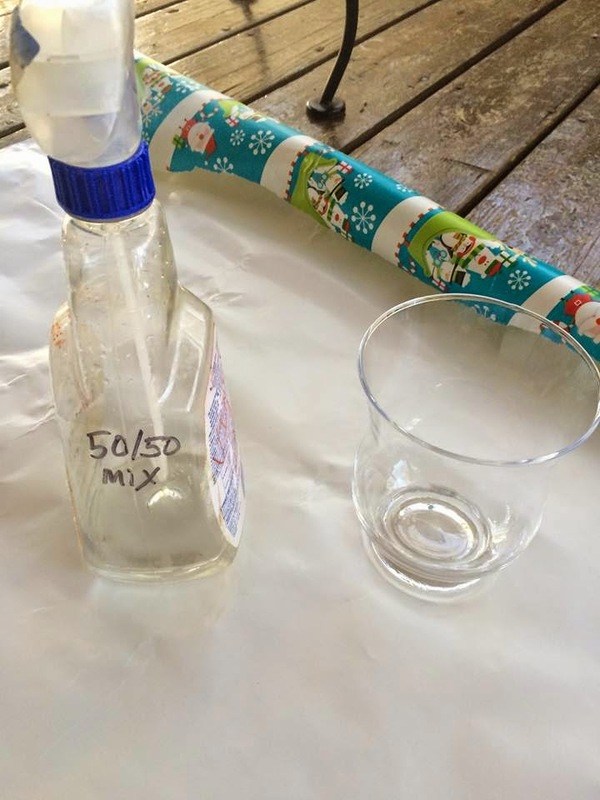 Once I gathered all the jars, candle holders and vases I wanted to use, I took them out to my back porch, put leftover wrapping paper down for protection and finely misted the inside of each glass with a 50% water, 50% vinegar mixture. I misted only a small burst of the vinegar water into each glass. Be sure whatever spray bottle you are using is set to "mist." The idea is to not soak the glass but to "bead" the mixture on the glass. The vinegar water helps to keep the paint from sticking in the areas in which it is sprayed. Next, I sprayed a small burst of "Looking Glass" paint on the inside and rolled it around. 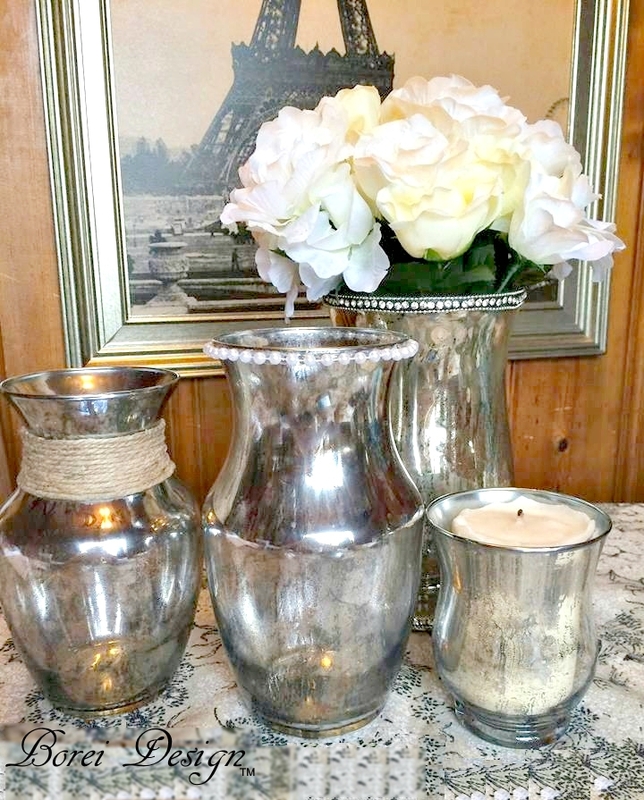 A special mirror finish paint (such as the shown) is necessary to achieve the faux mercury glass look. The paint is very thin. Just keep rolling it around inside the glass coating all areas and turn upside down to drain. Note: this paint "mirrors" as it dries. It's important to allow it to dry between each coat to get an idea of how it's actually going to look. I think I ended up adding several extra coats (thinking it wasn't dark enough) on some of the glasses when it probably wasn't necessary. 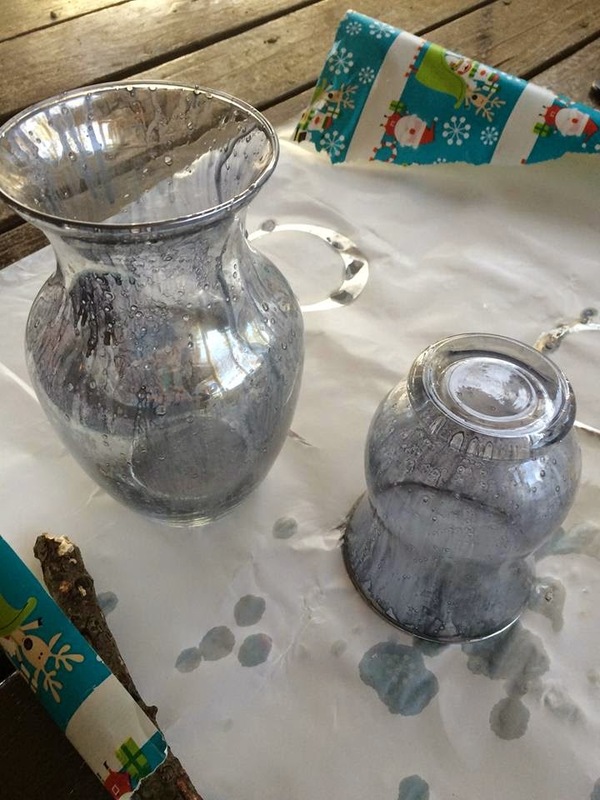 ALTERNATIVE METHOD: I sprayed one glass with less coats of paint and did not pre-mist with vinegar water. 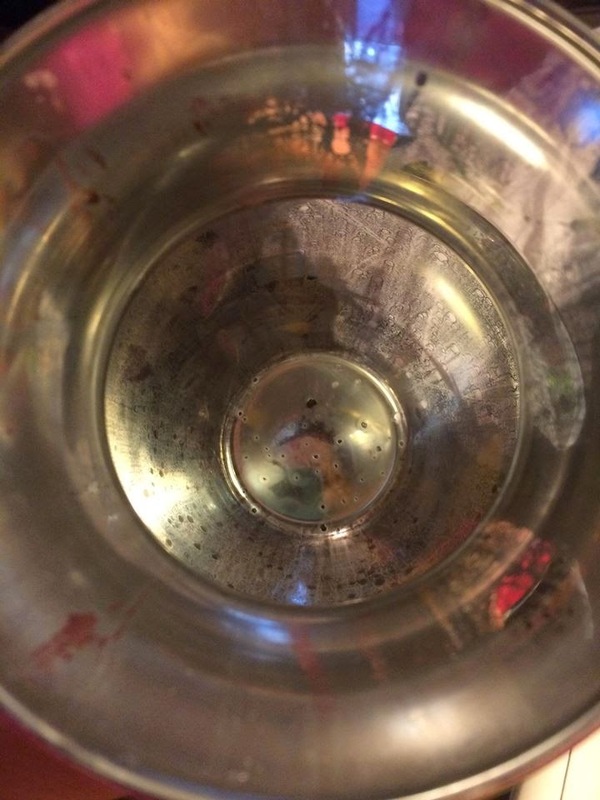 Once dry, I rubbed areas inside the glass with a paper towel dampened in rubbing alcohol. This gave me a more transparent, streaky look verses the "spotty," fully mirrored affect that I achieved by pre-misting and applying numerous coats. You can play around with the various steps of painting and distressing contained in this post to achieve the look you prefer. 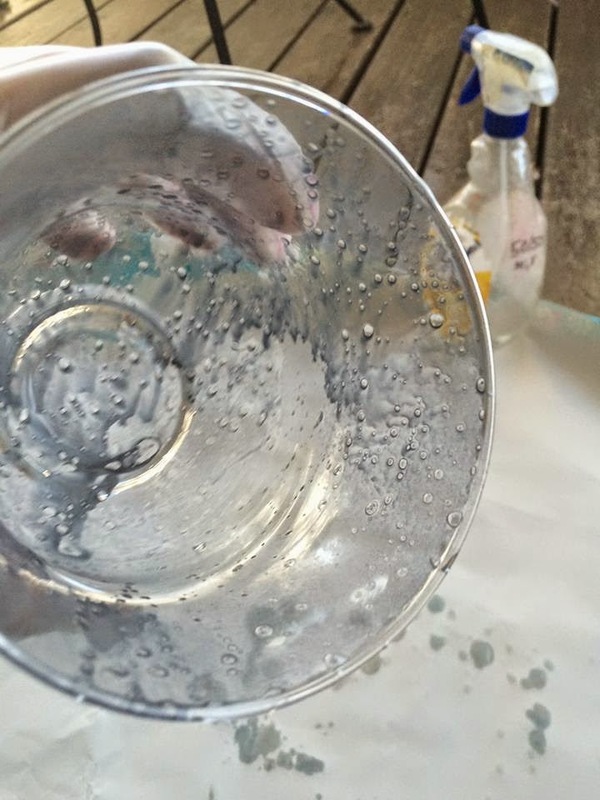 Once the glass dried completely, I used rubbing alcohol to clean up any spill streaks on the outside of the glass. 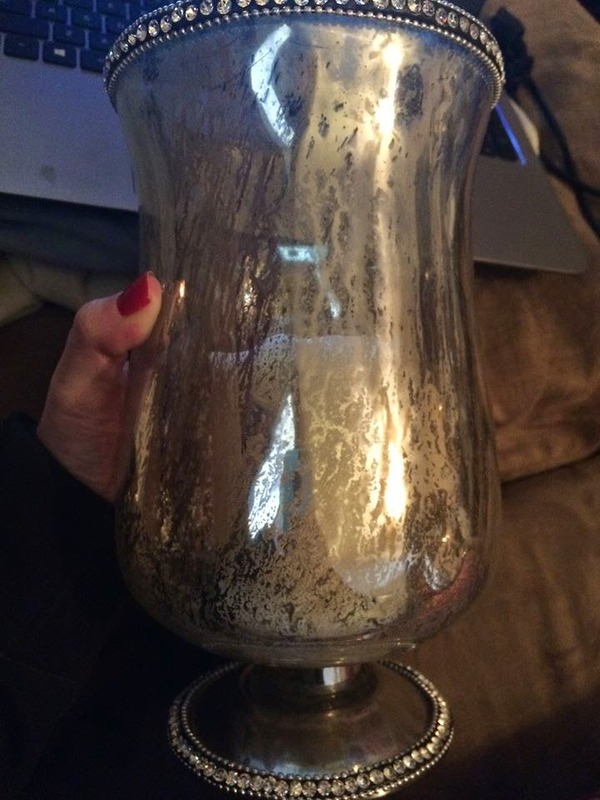 I also used cotton swabs dipped in rubbing alcohol to rub away additional spots of rhw paint inside the glass to add more of a distressed look. If you are already happy with the look, you can skip the additional rubbing of the inside. Here is a pic of the finished inside of one of my vases. To recreate the embellishment seen above, I glued on 1/4 inch, black satin ribbon, added a row of rhinestones in the center and then attached thin, silver toned, bead trim on each side. On some the others I used jute twine and a faux pearl bead trim. 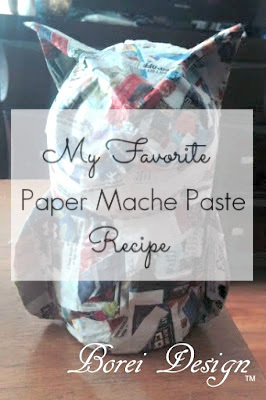 There's really lots of great embellishments and trims out there that look great with this project. 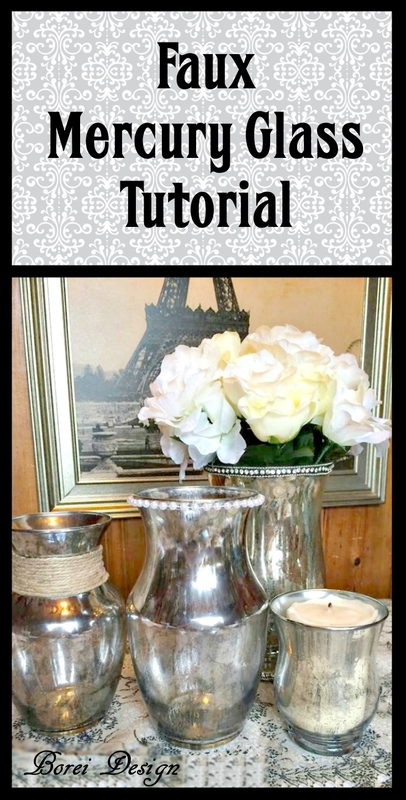 I hope you enjoyed this tutorial, thanks for stopping by and until next time, happy upcycling! Love this idea. I am going out to my recycle bin right now. I've looked for this product and been unable to find it until recently. Now I remember why I wanted it--your examples are beautiful! Hi there! I found you on HT. I love this project. In fact, I am a huge dollar tree fan. Not sure if you saw on HT this month you can hashtag me #Debbiedoos. 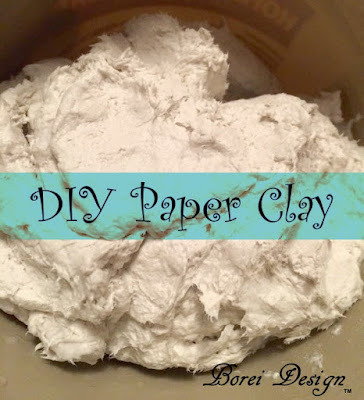 I am doing a monthly dollar seasonal craft and encouraging everyone to share theirs as well. I was happy to see yours. Also, we are neighbors, I live in TC, SC. Craft on! Nice to meet you. Beautiful! If I were to add another coat of the Krylon do I need to spray the water/vinegar mixture before spraying again? I didn't Connie but you can just play around with it and see how different techniques will affect how the paint adheres if you would like. Love it. Yours turned out beautiful in your vignette setting. This looks like a fun project too. I'm sure I have some vases around the house I could use. Making plans now. I just love these! 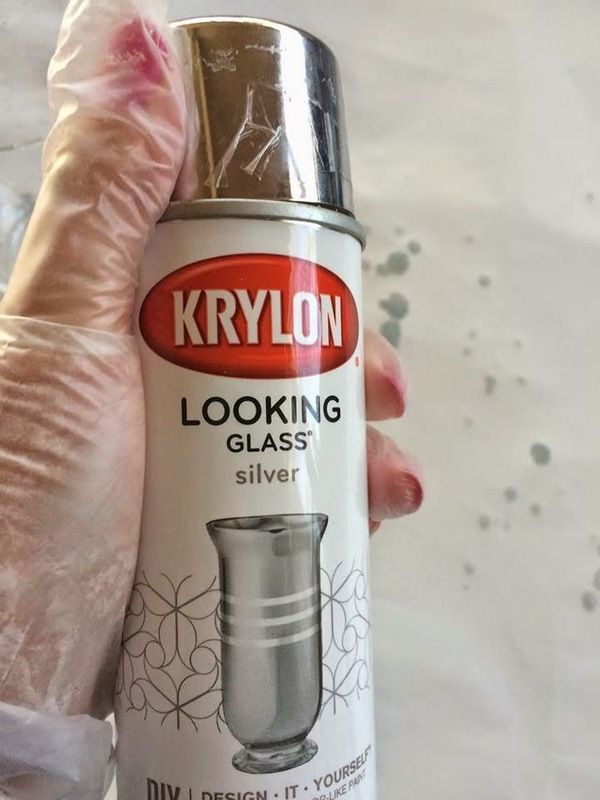 I have seen the Looking Glass paint at our Walmart, and have been wanting to try it. Now I really want to. Just wish it was not so pricey! Thank you for the lovely detail of your project. 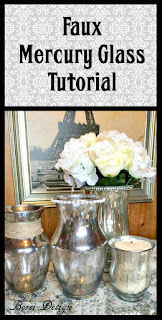 Very nicely explained and your vases look great.